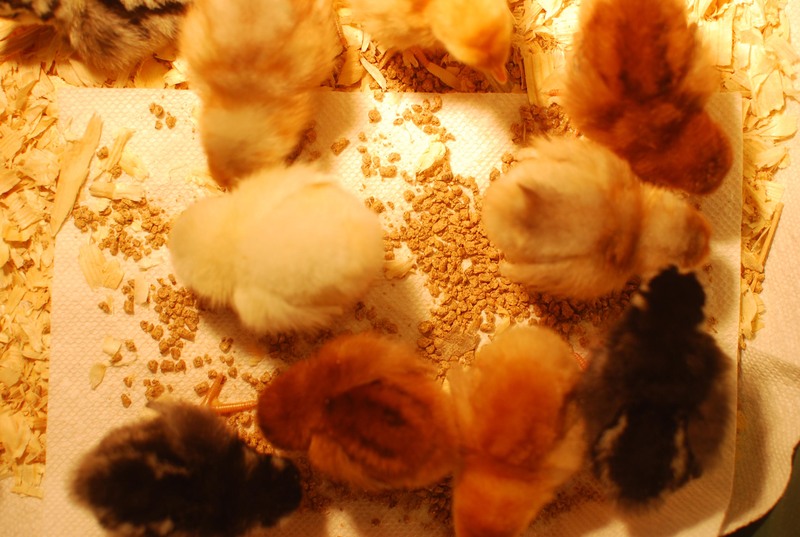 The baby chicks are here! (Obviously!) Wednesday we spent several hours setting up the cattle feeder we are using for a brooder this year. 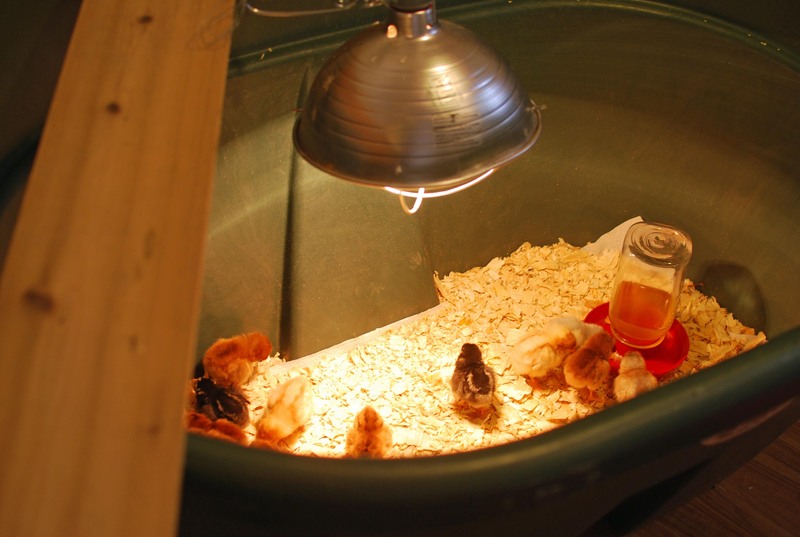 We lined the bottom with paper towels and pine shavings, cleaned up our waterer, and most importantly, set up the heat lamp. 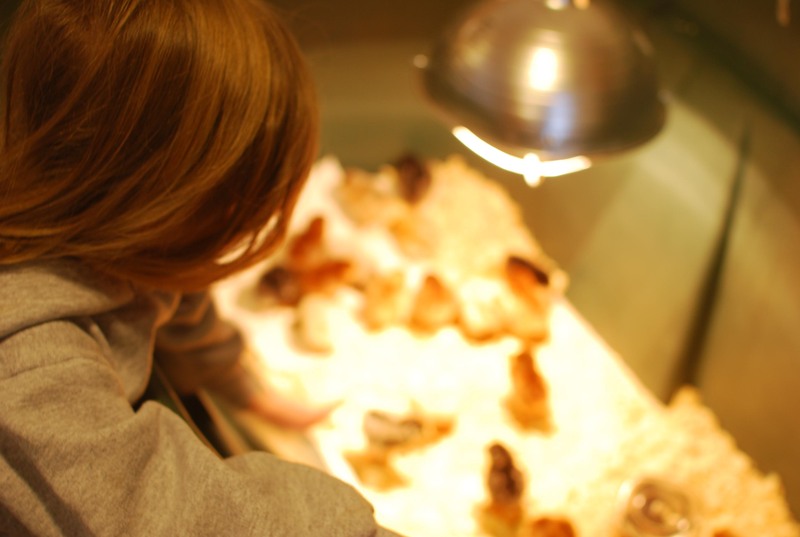 It took several tries to get the brooder to stay at a comfy 98 degrees; we had to adjust the lamp, let it set for while, check the temp and try again, but we were ready this morning when the call came from the post master! Daddy pulled on his coveralls and braved a path to town through the snow that came down in buckets yesterday. He came back with this! Oh my! I had forgotten how tiny they are! 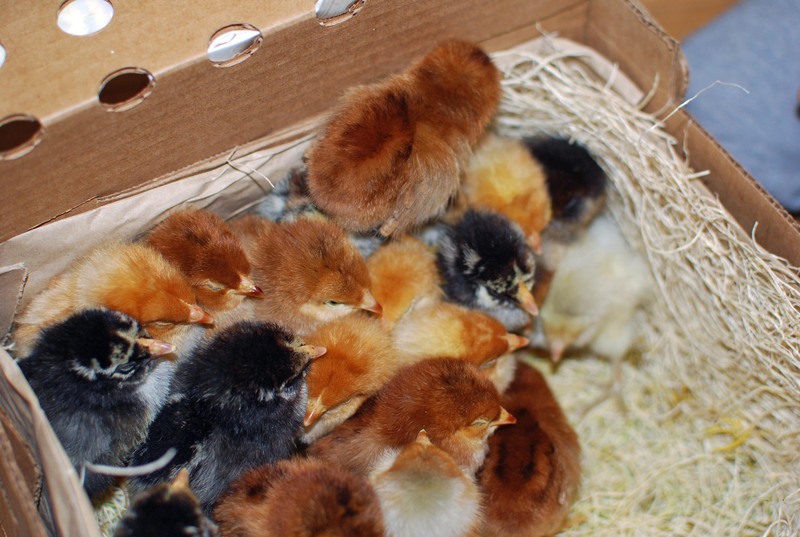 I wasn’t able to get the bantams I wanted, but when I saw these it was hard to imagine a smaller chick. They are just SO little!!! then dunk its little beak into the waterer. They were so thirsty! 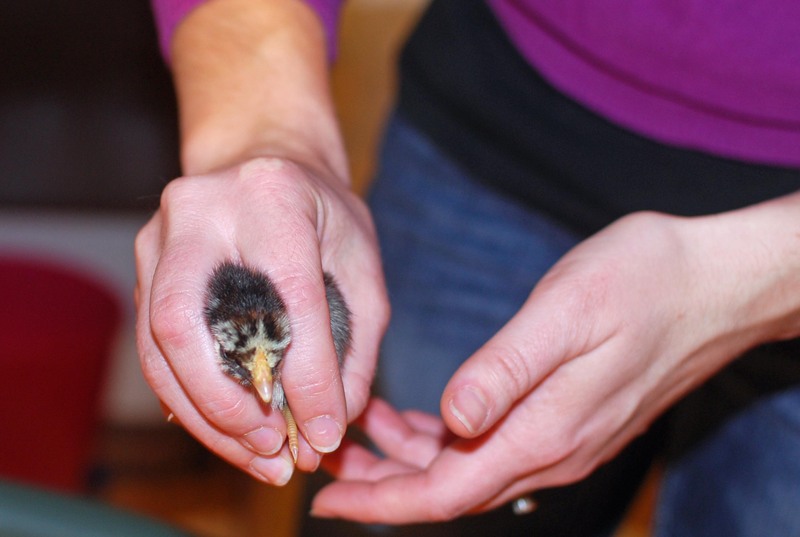 Usually our chicks come in 24 hours, but this year it took 48 (snow storm?) so I was surprised to see how they went after the water. Poor things! I should add that I am very pleased someone obviously took care of my chickies as they were traveling in the horrible weather. All arrived alive and seem healthy! 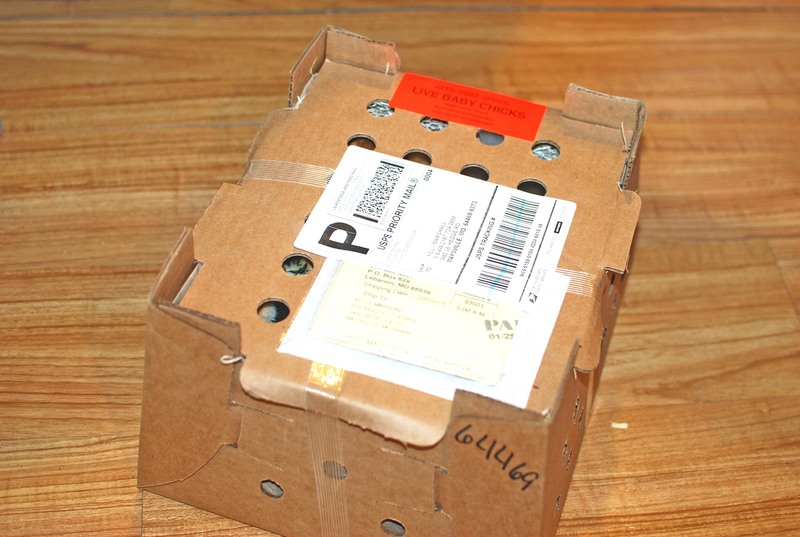 So if you work for the post office, Thanks! 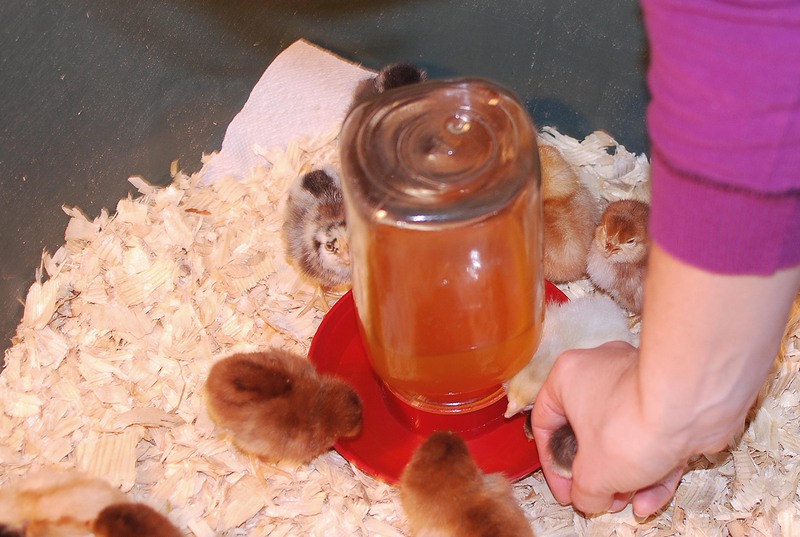 When everyone had water I added a paper towel with a small amount of chick starter feed. They went after this with a vengeance as well! And then the really difficult part. If anybody asks we were observing them to make sure they were comfortable and everyone was eating and drinking, but really we were just having so much fun watching the funny things they do! My favorite is when one of them is running around, eating or drinking or whatever, and then decides she is tired. They pretty much just fall down where they are, head out, sometimes wings out, and fall asleep! 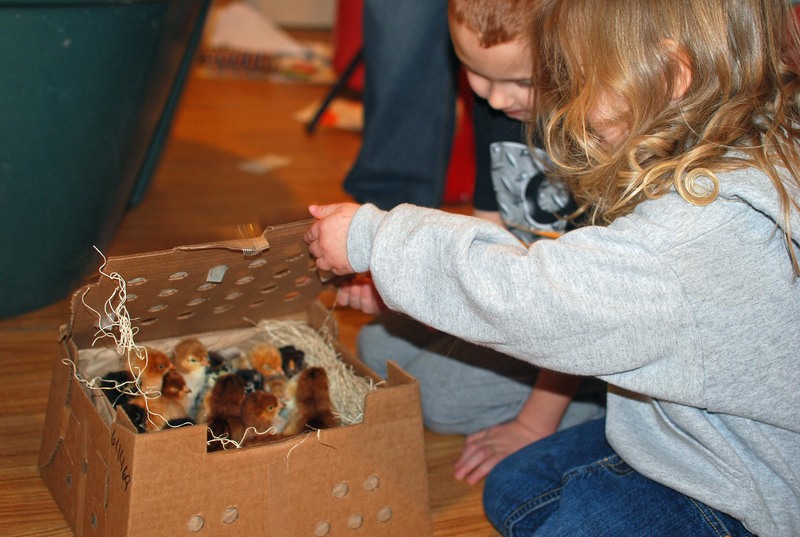 They also scratch and peck just like the big birds do, but its hilarious to watch these itty, bitty girls trying it out! I didn’t let the kids hold them today, too much stress for day 1! Finally they got tired of “observing” so we shut the door and left the chicks in peace. The cheeps have died down and I imagine they are all snoozing in the warmth with full tummies :-). Great idea! But im doing a science fair project and they will have to live in a seperate habitat should i just use boxes??? As long as they all have their own food, water and heat lamp individual boxes would be fine. A way to separate them with chick wire might make them more comfortable, since they could see each other. LOVE! So educational and fun at the same time.